AFRICOM-Lite: The Obama Administration’s Security Governance Initiative for Africa. While the media attention in the United States is riveted on the Israeli war against Gaza, on the ISIS offensive in Iraq and Syria, accomplished for the most part with guerrilla-trained by U.S. allies (Turkey, Saudi Arabia, Jordan, Israel), and the ongoing attempts to consolidate the neo-liberal hold on the Ukraine in the name of “democracy”, some other global developments have gone largely unnoticed. Among them is the August 6, 2014 announcement of a new Obama Administration “initiative” for Africa. Actually there are two: the so-called “Security Governance Initiative for Africa” (SGI) on the one hand and “the African Peacekeeping Rapid Response Partnership, called A-PREP for short, on the other. Old wine in new bottles?…or old wine in old bottles slightly polished up? SGI involves providing aid – with string attached as usual – to Ghana, Kenya, Mali Niger, Nigeria and Tunisia. On one level SGI is a response to the threat to African development posed by Islamic radical groups Al Qaeda of the Maghreb (AQIM), Al Shabbab, and Boko Haram, but its ulterior motive – actually quite openly stated is to make the targeted African countries more secure for foreign investment, thus as the old cliché goes, killing two birds with one stone. The stated goal of the program is to insure the security environment of these countries as a way of encouraging future U.S. investment, and as Tunisian commentator Yassine Bellamine notes in a recent article at the Tunisian website Nawaat.org “as a way to play a more active role in what is shaping up to be a new investor El dorado in the near future , Africa.” (my translation). Both poorly funded and in competition with other U.S. sponsored initiatives, A-PREP is an essentially an attempt to make African militaries better responsive to security emergencies. The funding of SGI in the first year entails a mere $33 million to be divided between the six countries involved. Not much really. A-PREP will disperse some $110 million to the countries it covers, perhaps a bit more that SGI funding, but in the end, not all that much. Perhaps the funding will increase in the coming years? SGI is in some ways a more classic counter-insurgency program whose goal is to strengthen economic development by strengthening security. At least “in principle” it tries to coordinate private sector foreign investors with the African militaries and U.S. military advisers so as to make security measures a kind of team effort of all, thus sharing the financial and human risks. 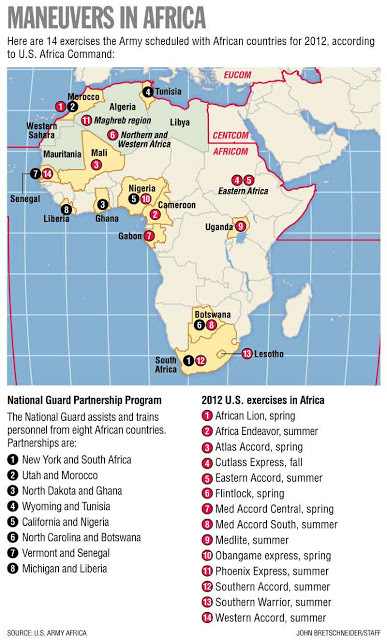 These programs appear to be a way to somewhat soften U.S. security moves into Africa after a period in which African nations have become somewhat wary of what might be called “the AFRICOM approach.” It comes after a several year effort to find an African home to host AFRICOM has failed. To sweeten the pot, allay fears and to involve the corporations themselves in the business of securing their own profits, these initiatives have been undertaken. Given the paltry amounts with which each of the two initiatives is funded, it is difficult to take either of them seriously. Earlier this year, in May, the Obama Administration proposed a $5 billion “Counter-terrorism Partnerships Fund” to Congress that would fund anti-terrorism projects in 35 countries. Cut by Congress to a $2.9 billion program, still it remains a sizable international commitment. SGI and A-PREP. In contrast proposed funding for SGI stands at $65 million, that for A-PREP at $110 million a year over a three-to-five year period. Add to the mostly symbolic sums the fact that the programs are largely redundant with a number of other and better funded AFRICOM related programs and one has to wonder if these initiatives are little more than an inter-agency rivalry in which the State Department is trying to elbow its way into African policy more and more dominated by the Defense Department and presidentially-directed operations like the secretive “Special Forces Operations’ Command” (SFOC). Both initiative were announced at the tail end of a Brookings’ Institute conference held two days prior, on August 4, 2014 entitled, “The Game Has Changed: The New Landscape for Innovation and Business in Africa” that featured a gathering of international business people, government officials, academics concerned with Africa. The main concern of this corporate-state- academic shindig was to insure possible investors – U.S. companies, it is claimed, have already invested some $33 billion in Africa – that the security situation on the continent will be assured. As a part of this “happy think” the conference assured its participants, a bit too often it appears, that the economic and social situation on the continent is improving some and that life in general is getting better, a position that requires considerable public relations skills to substantiate. The basis for this untoward optimism was sketched out by Yassine Bellamine (cited above) that gives projected growth rates (based mostly on African Development Bank stats) for a number of African countries. Projected growth rates for Ghana in 2015 today stand at 8%, Kenya in 2014 at 5.7%, Mali at 6.7%. The African Development Bank also predicts a turn around in the Tunisian economy from its -1.8% shrinkage in the coming years. Historically, such traditional statistical measurements of economic growth relate very little – virtually nothing – about expected rates of employment, income distribution, or state funds going to social programs. Nor do they indicate what branches of the stated economy are expected to growth. So even here, the rosy picture probably does not reflect the situation on the ground, or if it does, rather poorly. Bellaine goes on to indicate that initiatives like SGI have ulterior motives, noting that they have more to do with providing a safe environment for multinational corporate investment, than providing security for the nations involved. It is true that SGI gives priority to U.S. economic interests and strategic goals in Africa and at the same time, will press the governments involved to make the necessary legal and economic reforms to make foreign investment “more efficient” , with all that this implies. She wonders whether while such aid, which helps alleviate the country’s short term crisis, would in the long-term, have a deleterious impact on Tunisian economic growth perspectives. Bellaine’s critique, for all that is rather mild, suggestive. Essentially she is raising an issue that not just Tunisia, but all of the countries accepting aid by these programs, face. To what degree will the countries involved be drawn into U.S. strategic plans for both sub-Saharan Africa and the Maghreb. What is the end game? What is “the catch” for as is well-known, aid always comes “conditional.” Do the countries involved understand the conditions? Have there been extensive national discussions? The answer to these more profound questions is quite obvious. Other critiques have been voiced. They vary from the milk-toast variety that essentially accept the logic of the program but raise a few technical issues, to more profound critiques as to consequences of such programs. ∙ In an article in published at the Brooking’s Institute website “the U.S.-Africa Leaders Summit: Security Initiatives Are Critical to Cementing Africa’s Gains”, Dane Erickson (University of Colorado – Denver) and Alice Friend (former Principal Director for African Affairs at the Pentagon 2012-2014) while supporting these security initiatives, take a more somber view of them, noting that “…the U.S. and its African security partners must move beyond hollow discussions of the ‘militarization’ of U.S. -Africa policy, a criticism most associated with the U.S. Africa Command (AFRICOM). In that light, while not giving much detail, Erickson and Friend note the lack of enthusiasm (and one might add general failure) of previous efforts to militarize Africa, specifically the much touted – at least in government circles – Trans- Sahel Counter-Terrorism Program. Other than the adjective “new” this is an accurate description of what these programs are about. SGI, A-PREP and like programs essentially parallel U.S. efforts to extricate itself militarily from Afghanistan and Iraq by placing more of the military/security burden on regional allies, and less on the U.S. military, spread increasingly thin worldwide. While the results of turning over security operations in Afghanistan remain to be seen – but already have raised grave doubts as to the viability of the Afghan military to accomplish the task – the effort to achieve such a new security balance in Iraq is – as the whole world duly notes – an utter failure, harkening back to the “Vietnamization” policies of Nixon and Kissinger forty years past. In the case of Africa, strengthening the “efficiency” (think of what that has meant historically) of African militaries is a part of a strategy of minimizing U.S. “boots on the ground” – to use the clique to avoid the term “military intervention” by trying to give Africans more of a role in supporting foreign corporate penetration of the continent as if it were in their own interest. It is based on what is now a well-worn fact that Third World militaries love getting high-tech military toys that kill. It is also based on another well-worn tradition: if a world power cannot win “the hearts and minds” of the people of Third World countries that might have some economic or strategic importance, at least through military aid, the countries generals – a thorough corrupt and undemocratic lot – can be bought off. De Waal and Mohammad rightly point out that as a result of programs SGI, A-PREP type programs that the United States is “in effect providing foreign tutelage to the militarization of Africa’s politics, which undermines peace and democracy throughout the continent. American diplomacy. American diplomacy is becoming a handmaiden to Africa’s generals.” And they might have added to multi-national energy and mining interests that are tripping over each other’s feet to exploit an already over-exploited continent. This analysis is, as the British say, “spot on.” It builds on at least two other political and human rights failures of the post World War II period: U.S. policy in support of Latin American military dictators in the 1970s and 1980s – the Pinochets, the Argentinian, Brazilian, Paraguayan juntas, the El Salvadoran death squads of which Ronald Reagan was so fond. The other example is what is referred to as “Francafrique”, the French effort to keep the fruits of its colonial heritage in Africa alive by supporting military dictatorships in such places as Chad, Mauritania, Congo Brazzaville, Cameroon, Burkina Faso to say nothing of Algeria. De Wall and Mohammed don’t stop here. They underline the dangers to development and democracy of supporting the armed forces in Africa, concerns that have not resonated in a Washington DC fixated on competing with China, India, European allies like France, Italy and others in that mad race to control Africa’s oil, gas and mineral wealth. Using South Sudan and Nigeria as examples, they remind NY Times readers, and Washington policy makers the degree to which U.S. military aid to Africa have disappeared down “black holes,” essentially referencing the extraordinary levels of corruption, outright government theft that has accompanied such programs where aid money is shuttled into the private accounts of ruling generals, siphoning off millions “while much of the population (of the countries involved) lives in deep poverty.” Frankly there is a whole list of other African countries that could have been cited, the recipients of military aid from the United States, France and other countries. ← Rouen Chronicles – Robert Merle – 2 – on Algerian Political Figure Ahmed Ben Bella.